Two collectors in the Netherlands and Japan published in succession the books aimed at introducing a variety of toys which Nintendo had developed and sold to Family Computer in 1983; Before Mario by Erik Voskuil and Nintendo Complete Guide – Toys (abbreviated as Complete Guide) by Isao Yamazaki provide an amount of materials suitable to look back on the “transition period” of postwar Nintendo, which intended to develop a new market in conversation with contemporary manners at that time. Firstly, take a look at the table of contents of the two books. These sequences of chapters moderately reflect paths which the company changed direction of a company specialized in making cards as such hanafuda, trump, and karuta, and then tried to transform a generic toy company, and finally dealt with electronic equipment. As Voskuil describes, the transition also reflects the change of materials used in toys from plastics and cardboard to electric motors, mechanical parts, and electronic components . Complete Guide traces Nintendo toys from its foundation in 1889, while Before Mario particularly set a certain periodization, or “from 1965 to 1983.” The starting point of 1965 has a critical implication in this book. That is the year Gunpei Yokoi, who served as an engineer and manager of the R&D department, entered Nintendo. Satoru Okada, who developed many products under him and worked as a developer and producer at Nintendo until 2007, contributes a forward for Vodkuil’s book. He was “the first real electronics engineer hired by Nintendo. ” Also, transistors were firstly used in Nintendo products in 1965 . The period from 1965 to 1983 corresponds to the introduction period of electronics for Nintendo. I will briefly express difference in the two books. Complete Guide (20.8 X 15) aims at an exhaustive catalog as its name suggests and massive in amount. There are over 450 photo images of products, and additionally it features fliers and TV commercials. It is a characteristic point that the book has each chapter on card games and arcade games. Furthermore, there is a list of Nintendo products from 1889 to 1985 at the end of the book. On the other hand, Before Mario (20 X 24) describes 52 items in its landscape format. The pictures arranged in the broader plane show well that individual products are still good for viewing, and the arrangements as such are taken care not to be seen as monotonous when reading the book through. Each item has a description about how to use and historical context with simplicity and precision. Thus the two books are contrasted in terms of an editorial policy, and have complementary relationship in a way. I noticed some points after making a survey of Nintendo products before Famicom. For example, we could easily overlay the development of Game & Watch with that of Nintendo hand-held consoles after Famicom: widescreen, multi-screen, foldable shape, equipment of D-pad, and full color screen. Is it possible to read other continuity with modern Nintendo from these products? At first, he had charge of easy jobs such as maintenance and inspection of production equipment of hanafuda and trump cards. But he had come to ditch his job and make his own toy due to having nothing to do. Because he had liked to make things since childhood. And as soon as [Hiroshi] Yamauchi saw the toy, he summoned Yokoi and ordered him to “commodify it as a game.” That was the birth of Ultra Hand . As with Yokoi, Satoru Okada dealt with such a definition of a game. I use the term “definition” here because they, engineers, were requested to create new rules for games from present technologies and materials, not conforming to existing formats and rules for games like Ogura Hyakunin Isshu and Sugoroku. There is a copy like “fun-filled – Nintendo novelties [idea products if translated literally]” in an advertisement at that time . What was really surprising was that I was given all these assignments even though it was my first year at Nintendo! The only background I had was what I had just learned at school and unfortunately, within the company, no one could help me with all the technical difficulties I had to face! Luckily, I received some advice from engineers working for other companies and I was able to complete this project . Also, toys such as Ultra Machine, Love Tester, N&B Block series, and Color TV-Game series were produced in vividly response to manners, fashions, other games by competitors at the time. It is not difficult for us to find strategies to survive as a company there. Many products were produced trial and error processes, synchronizing with contemporaneity, and an amount of them were tragically cut short about their future development. However, some of them are the things like “this must be Nintendo” (for instance, Ele-Conga to me). 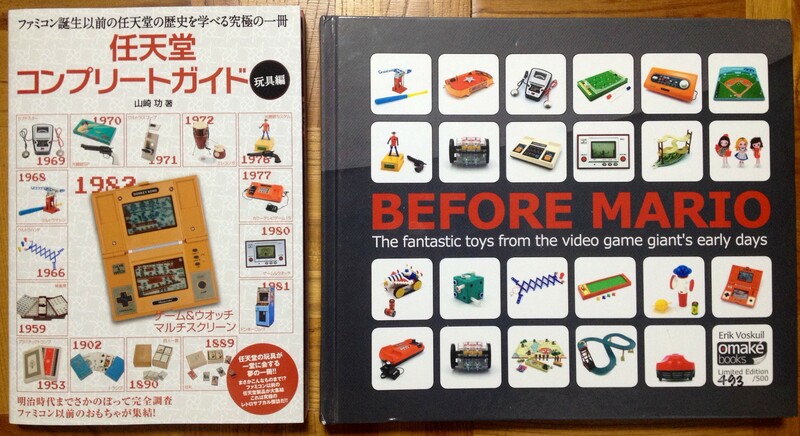 We could learn that ways to Famicom are not unique and straightforward from these books. The point is this “diversification of management” had started before Yokoi entered the company. In 1949, Hiroshi Yamauchi was inaugurated as the third president, and in the 1960s, he took the lead in the taxi business and development of instant food as well as the breakaway from a company devoted exclusively to card manufacture . Furthermore, we could read “a longing for characters” as a negative image when seeing through the outcomes of constant development of new products. As everyone knows, there are a lot of game characters defining the brand of Nintendo today, while we can confirm that Nintendo “before Mario” had produced vast numbers of licensed products: Mickey Mouse, Ultraman, Kamen Rider, Kogarashi Monjiro, Osomatsu-kun, Kamen no Ninja Akakage, Popeye, etc. Nintendo also actively localized products created by other companies such as Hasbro, Neuhierl GmbH & Co. KG, Milton Bradley Company, and Parker Brothers. Additionally, considering the year 1981 as a turning point because of having an in-house character called Mario, it is an interesting fact that Nintendo stood troubles about copyright directly or indirectly from the late 1970s to the early 1980s. The well-known Yamauchi’s statement “There no patents about use of play” had a certain background that Taito sued other companies for producing and selling unlicensed Space Invaders clones at the time (Nintendo also released a clone named Space Fever). And Universal City Studios sued Nintendo for copyright infringement of King Kong in 1982 – it can be said that autonomy and application of games entered a new stage. In short, it corresponds to the birth of “game characters.” It is a symbolic case that all titles of Game & Watch Panorama Screen released in 1983 bore the names of the characters: Mario’s Boms Away, Donkey Kong JR., Popeye, and Snoopy . Nowadays, Nintendo often appears as a licenser rather than a licensee, however, a position as a company which sells its ideas is shown clearly and vividly as in-house characters are little seen in the two books. Erik Voskuil: Before Mario: The Fantastic Toys from the Video Game Giang’s Early Days. Omaké Books, Châtillon 2014, p.92. Erik Voskuil: Before Mario: The Fantastic Toys from the Video Game Giang’s Early Days. Omaké Books, Châtillon 2014, p.5.